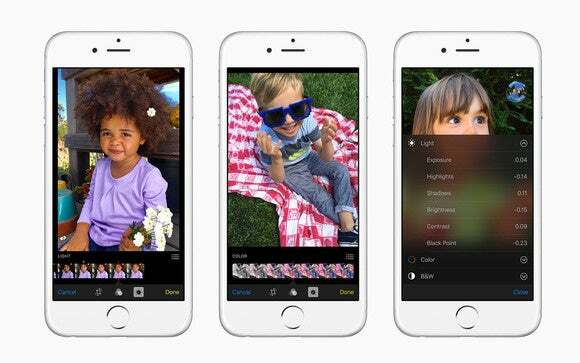 There's more power in the Photos for iOS app than you might realize. Apple probably thinks that not everyone wants to spend a ton of time correcting images. Heck, lots of people are content with a quick click of the Enhance tool in Photos for Mac or iOS, but that tool can’t fix every picture you take. If you want to lighten only the shadows, darken only the highlights, boost contrast, change color saturation, and more, you need the advanced editing power nestled inside the app’s Adjustments panel. Many folks have discovered and use that panel in Photos for Mac but they don’t realize that it exists in Photos on your iOS device, too. It lacks some advanced adjustments you can use in Photos for Mac (histogram, sharpening, noise reduction, vignette, and so on) but it’s well worth using. Ssince the screens on iOS devices are so small, it takes some tapping to reveal its hidden—and outrageously powerful—controls. Tap the icon circled here (left) to open or close the Adjustments panel (right). Tap the name of the adjustment (say, Light) to open its smart slider (bottom). To open the Adjustments panel in Photos for iOS, select a picture, tap Edit at the upper right of your device’s screen, and then tap the icon that looks like a little dial (circled below). Once the panel opens, tap Light, Color, or B&W to open its respective smart slider: a row of thumbnails that give you a preview of what that particular adjustment will look like when applied to your picture. Smart sliders are smart because dragging one adjusts a slew of other settings (called sub-sliders) behind the scenes. These are great for quick, basic adjustments. For fine adjustments, you can reveal a list of the adjustment’s sub-sliders by tapping the down-pointing chevron to the right of each category’s name (sub-sliders are discussed momentarily). To use a smart slider, tap and hold your finger atop the tiny row of thumbnails beneath your image and then drag left or right. For example, to darken an image using the Light smart slider, drag to the right so the red vertical line appears above the darker thumbnails; to lighten it, drag to the left so the red line is above the lighter thumbnails. Even simpler, drag your finger left or right across the image itself, not the slider. Once you open a smart slider, you can access that adjustment’s sub-sliders by tapping the icon that appears at the upper right of the smart slider (it looks like a tiny bulleted list). When you do, a list of that adjustment’s sub-sliders, as well as the other adjustments, appears. As mentioned earlier, tapping an adjustment’s name (say, Light) in the list produces a smart slider while tapping the down-pointing chevron to its right reveals a list of its sub-sliders. To use a sub-slider, tap its name in the list and a slider with tick-marks appears beneath your image. Simply tap and hold your finger atop the tick marks, or the image itself, and then drag left or right. To return to the list of sub-sliders and other adjustments, tap the icon at the upper right of the sub-slider. To use another adjustment—say, Color or B&W—tap its name in the list to open its smart slider or tap its chevron icon to open a list of its sub-sliders. When you tap to reveal an adjustment’s sub- sliders, you see this screen (left). Tap the chevron icon to the right of an adjustment’s name to show/hide its sub-sliders. To use a sub-slider, tap its name and it beneath your image (right). The tiny gray dot above the slider indicates its original position. To return to the list shown at left, tap the icon circled here. 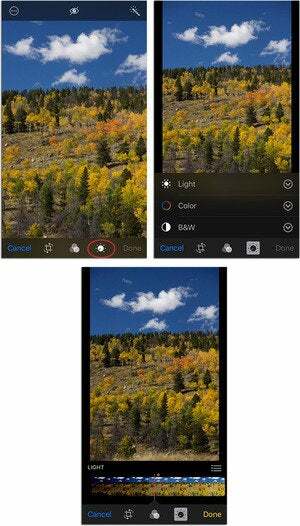 Undoing the changes you make in the Adjustments panel in Photos for iOS depends on what you’ve done. You can undo changes you’ve made with the Light and Color smart sliders and their sub-sliders by tapping Cancel, and then tapping Discard Changes in the confirmation sheet that appears. This strips away all the edits you made to that image during this round of editing, and spits you out of Edit mode. Alternatively, you can undo specific changes by moving each smart slider (or sub-slider) that you changed back to its original position, which is indicated by a gray dot above the slider itself (visible in the rightmost screen shot above). The Black & White adjustment, on the other hand, works like an off/on switch, enabling you to turn off just the black-and-white bit without undoing any other changes you made during this editing session using (say, using the Light and Color adjustments). For example, once you tap the B&W icon to reveal its smart slider, you see a tiny B&W label beneath your image. Once you move the smart slider, your image changes from color to black and white and the label changes from black to gray. To restore your image’s color, turn off the black-and-white effect by tapping the B&W label itself (it changes from gray to black). Here the B&W smart slider was used to turn the image into a black-and-white (left). 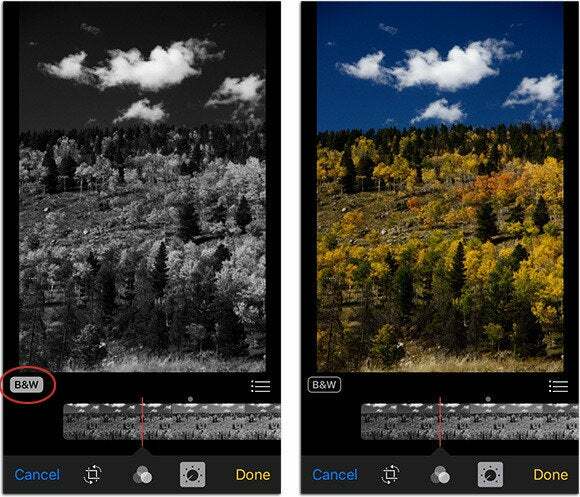 To turn off the black and white effect, tap the B&W label circled here (right). Close the Adjustments panel by tapping its icon at the bottom of your screen. When you do, its icon changes from gray to black and you can see more editing tools. Alternatively, simply tap the Crop or Filter icons which simultaneously puts the Adjustments panel away and opens those tools. Save the edited image and exit Edit mode by tapping Done. Photos saves the new version of the image and you return to the view from whence you came. Don’t worry: You can always restore the image to its original state by opening it in Edit mode again and tapping the red Revert button. In the confirmation message that appears, tap “Revert to Original” and your image returns to the state it was in when you imported it. Undo your changes by tapping Cancel. In the resulting confirmation message, tap Discard Changes and Photos removes all the changes you made in this editing session (changes you made in prior editing sessions are preserved). 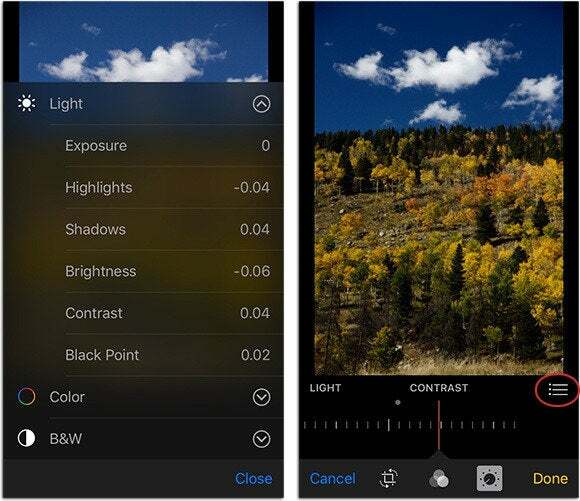 As you can see, there’s more editing power in Photos for iOS than meets the eye. It takes a little getting used to, but the ability to edit your images in such powerful ways on an iOS device, using a free program, is awesome. Until next time, may the creative force be with you all!